Hello, Internet! If you want to keep up with my photography, follow me on Flickr, Facebook, 500px, check out my other blog posts or even visit my portfolios. Cheers. I haven’t done a blog post in awhile. I’ve been extremely busy. It’s not that there hasn’t been things to write about, but rather that all of my photographic efforts have been exhausted outside of the day job and it just hasn’t left me with anything left to devote to writing here. However, a trip last weekend to the Racetrack has left me with a burning need to write, and unfortunately it is because of the worst kind of people. My mission was to capture some specific images of the Racetrack for a project. I made haste to get there as soon as I could before it got too hot. It is after all summer, and I wanted to get up to 3700ft before the main valley hit 110. It was in the upper 90’s when I finally started upon Racetrack Road. Oh Racetrack Road, you are still as bad as ever. Those 27 miles are always a relief when they are over. Finally, the Racetrack came into view. I was blissfully ignorant of what horrors were hidden from view at this distance. What follows is a mix of iPhone and Sony shots taken between 9/11/16 afternoon and 9/12/16 morning. The Racetrack is a very special place. There are only two known places on the Earth where rocks move on their own across a lake bed. How they move was a mystery until 2014 when a couple of researchers finally witnessed it. The conditions have to be perfect, and those conditions might not happen for years between events. This is because of course Death Valley is a very dry place, which leads us to why the Racetrack itself is so fragile. When wet, footprints can last for years before conditions reach the point where the surface can reset. This is why signs say not to walk out on the lake bed when it is wet. Well, you are also not supposed to drive on it. This is regardless of whether it’s wet or dry. Unfortunately, when I drove up to the first of the three parking spaces, I found this. It seems the worst kind of people have recently visited the Racetrack. The worst kind of people. 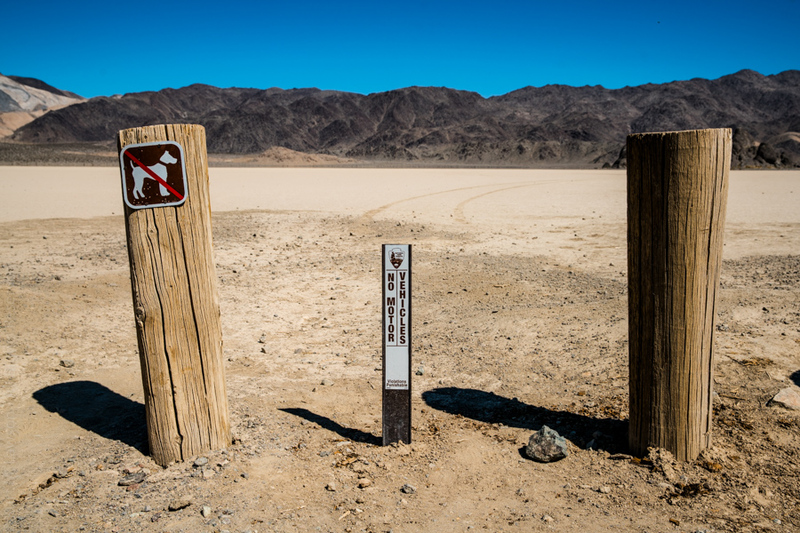 The Racetrack Playa has three parking areas. The middle parking lot offered even greater horrors. Whoever did this, they really had zero consideration for anyone else. The damage was so extensive by the middle parking lot I couldn’t even bring myself to walk out and get a closer look. By this point my heart was really filled with dread. “Oh God, surely they didn’t go to the rocks too!” I thought. I pressed on. At least one track ventures all the way to the rocks. They were thorough in defacing one of the most unique places on Earth. Yes, that’s a track that curves between rocks before looping around. Photographic compositions here will be ruined for years. Experiences will be marred by tire tracks next to rock tracks. My planned shots around the Grandstand were ruined for this trip. It appeared that these people drove out right from the Racetrack parking area. I don’t recognize the type of tread. Anyone know what these are from? It seemed to be pretty recent. It can be quite windy and I would expect the wind to erase the soft prints in the sandy dirty here before long. If I sound repetitive referring to these people as the worst, or bad, or terrible, or any number of other negative adjectives I’m not really sorry. This damage could last for years. The Racetrack is a special place. It’s not a place for cars to race, it’s a place for the Racing Rocks. Period. It’s a National Park. Be respectful. What I’m writing is incredibly tame compared to the thoughts that were racing through my mind as I came across this mess. This level of disrespectful, inconsiderate car track graffiti exceeded everything I previously thought possible. But unfortunately, the horrors would continue. 2016 has had abundant horrors. Out at the rocks, some fainter trails of … something … crossed through some of the area. I don’t know what to make of them or how old they are, but they are just as abhorrent as the car tracks. I don’t know what to make of this. At some other point on the playa there seemed to be bicycle tracks but the side-by-side nature here I find puzzling. This is minor compared to the final insult. A few weeks back I had heard a rumor that I prayed was not true. The rumor was that people were carving initials into rocks at the Racetrack. It’s been bad enough over the years that people steal rocks and move them. But this, this really takes the cake. At least the damage to the playa surface will one day be undone by the weather, even though it could take decades. This though, this will last far longer. These people, “D” and “K” chiseled a 1/8″ deep graffiti gouge into the surface of a large rock on the playa. How does one get it in their head that this is ok? How does one think “Oh, it’s the racetrack! Let’s drive on it!” How does one think “Let’s chisel our initials onto one of the special rocks!” How does one get to such a selfish place in life? I hope these people are caught. I know that hope is about as improbable as winning the Powerball lottery, but in a perfect world, these assholes would be brought to justice. Anyone with any information please contact Death Valley National park. Defacing the racetrack is a crime. I wish that the entire racetrack could be surrounded with severe tire damage spikes, carefully camouflaged to blend in unnoticeable from the surrounding dirt. 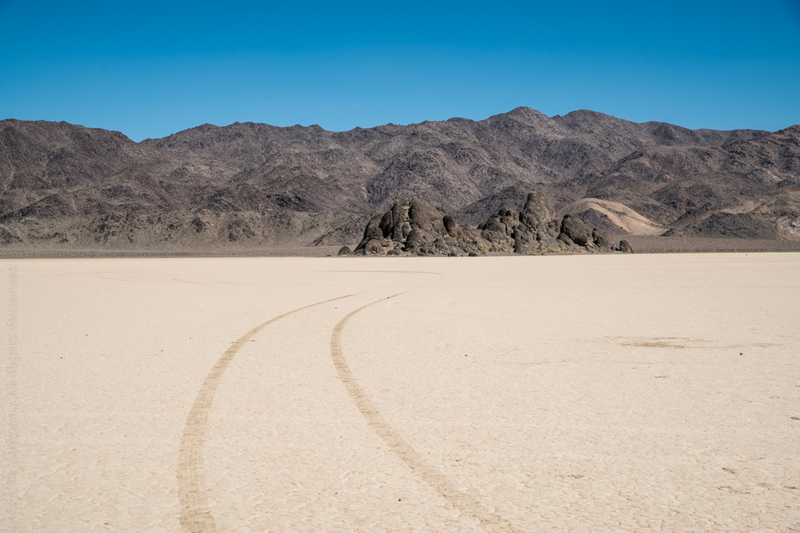 I imagine such a person as recently defaced this sacred place trying to drive upon the playa only to have all 4 tires shredded before they could damage much. This would necessitate a very, very expensive tow from Miller’s Towing out of Lone Pine. But such things are just thoughts. Please be respectful to our sacred and protected places. They belong to us, they don’t belong to just you. Please, if you know anything contact the National Park Service. Please don’t deface the Racetrack, drive on it, steal rocks, or chisel into the rocks. A few people have claimed that the car trails will not last years. I present you this shot from 2013 of vehicle tracks that you cross between the parking lot and the main moving rock zone. While I did not take a photo of these tracks on 9/11-12 of this year (2016), they are just as present now as they were then. It is plainly visible in Google Earth. I hope that the awareness instilled by this post will encourage others to document and report anytime they see anyone driving out there or defacing or stealing stones or walking out on the playa when wet. I hope it will encourage people to be respectful of this uniquely amazing place. And finally I hope that Death Valley National Park can do a little more to discourage driving out there and stealing / defacing rocks. There is certainly room for improvement in signage and in obstacles to getting out there. I want us all to be able to respectfully enjoy this amazing spot in my favorite National Park. Please enjoy the unique natural beauty of the sailing stones of the Racetrack and leave no trace that you were there. And finally I’ll add one of my photos from my first ever visit to Death Valley and the Racetrack back in 2008, when I fell in love with this incredible place. Edit: I was interviewed live on Facebook by the Weather Channel’s wonderful Domenica Davis to talk about the damage and what makes the place special.